Just about a year ago, I sold my car, became a one car family, and switched to a 10-speed as my primary means of transportation. I did this to deliberately challenge myself, create more happiness in my life, and add one building block to ultimately achieve financial independence. I have been pleasantly surprised by how effective changing this one habit has positively impacted my life. In the last year, I’ve pedaled over 2,000 miles. I started this experiment at the tail end of Colorado’s winter season and am now again in the midst of snow and below freezing temperatures. As I mentioned, part of biking as a primary means of transportation is about taking on the challenge. What I’ve learned so far is that it’s not just the fitness challenge that has been beneficial – but a multi-pronged challenge that involves planning, experimentation, and overcoming all sorts of physical and mental discomfort. A couple of weeks ago I did a 40-mile, three and a half hour, ride at the crack of dawn when the temperatures were scarcely breaking 14°F and the Weather Channel said it “felt like -7°F” with the wind chill. A tad bit nippy to say the least. On top of that, it was snowing off and on and there was ample moisture on the roads that made it’s way to my feet and legs. All are legitimate pieces of feedback and reasonable things to say. However, as any biker will attest, you learn something about yourself, your approach to biking, and the universe on each and every ride (something I could never say about driving). A year in, I thought I would take a moment to share with you some of my strategies, tactics, and winter bike gear to keep your gears turning during the cold months. During my first winter, I made some easily avoidable mistakes during my commutes. Thankfully my initial commute from our Park Hill house to my old office was only about two miles (I have since moved South of Denver where my shortest commute is about 5 miles). When your regular commute is only 2.4 miles, gaps in your winter protection and gear can be very forgiving. But I don’t just commute to my office. I also commute to appointments and to run errands regularly and these can be anywhere from 5 to 20+ miles each way. One time I got out of a meeting after dark during a snowstorm. I was in an industrial part of town about 10 miles from home. Part of the route had me go on a dirt road that had turned muddy-puddle-mess. The gloves I was wearing were rated to 35°F and it was well below 20°F. My primary navigation system was my phone which I had to keep in a pocket beneath my hard shell jacket – which required me to frequently stop, de-glove, and reorient myself. With each stop, my ride time extended and my hands got colder. In these moments, it’s hard not to think, “this might be a mistake” in your head. So I thought I would frame this guide into the context of mistakes I’ve made. Because if you do choose to bike in the winter, I want to help make sure you have as few of these moments as possible. 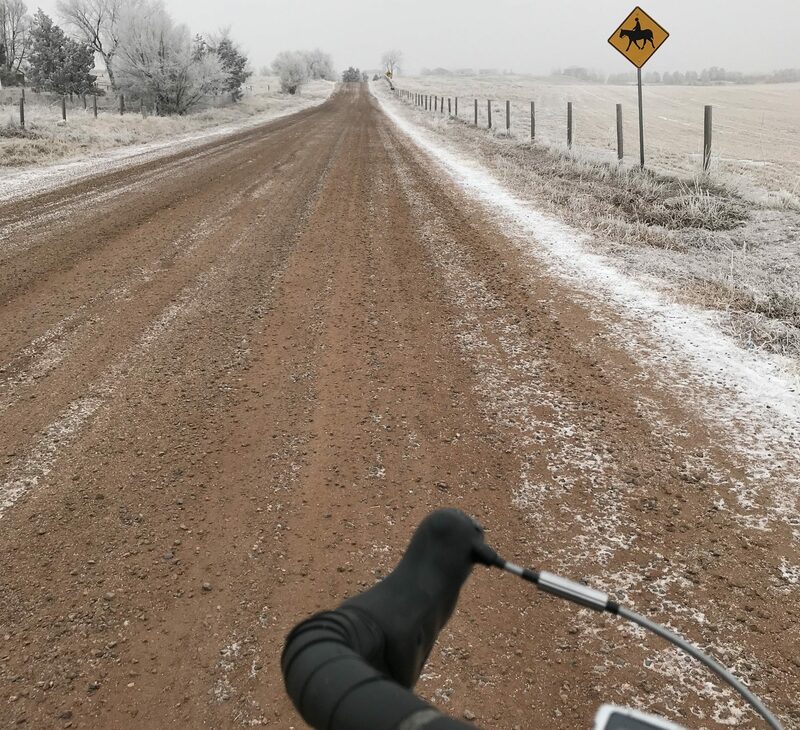 The first time I rode during a light snow, it happened to be a very dry climate. The snow was not sticking to the roads and the roads stayed relatively dry. The snow was also light enough that the heat from my body made any moisture evaporate on my clothing before accumulating and becoming a problem. This gave me the false comfort that I didn’t need any special clothing when it snowed. So when it snowed a little heavier and wetter about a week after this first ride, my work slacks became soaking wet, my socks and shoes froze, my feet quickly numbed, and my drenched legs started to get frostnip. I decided if I was going to keep doing this, I needed to approach winter biking much in the same way I approach snowboarding. Looking at what gear I had lying around the house, my snowboard pants and jacket became my initial go-to for future snowy ventures. They easily fit over my work clothes, kept moisture out, and were very warm (often too much so). The downside was how baggy they were. A couple of times the loose pant fabric got caught in my bike sprocket. This can be avoided with a simple ankle strap. Also, my North Face jacket was not built for biking – so the forward position you maintain while in the saddle exposed my rear waistline periodically and bunched up in the front. Both are things that don’t add up to a big deal on short rides. Longer rides (1+ hour), those small exposures can take a toll. On one couple hour ride in the cold, I felt occasional frostnip across the exposed tailbone area where my jacket did not cover. The sleaves also pulled back and exposed skin when I was in my forward biking position, exposing my wrists. Again, not a big deal on short rides, but longer rides it became a hazard. 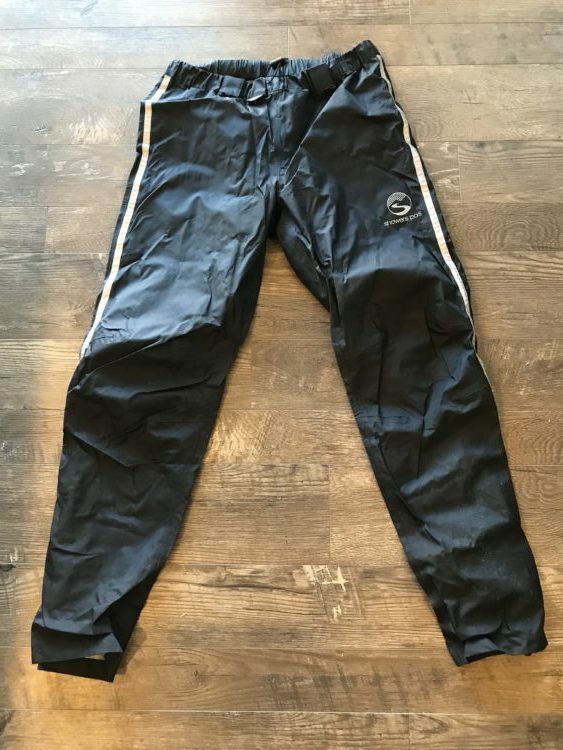 When temperatures began to warm up, and summer rains began, I realized that my waterproof snowboard pants and jacket built for cold weather were less than ideal for simply keeping the rain at bay. 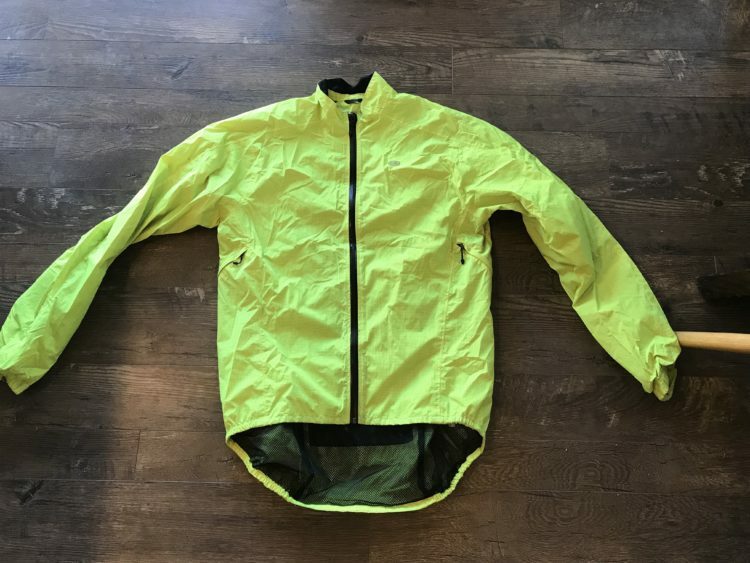 I purchased two bike-specific pieces of outerwear, Shower Pass pants, and a Sugoi Zap Bike Jacket, for moisture barriers. These barriers have been almost-perfect throughout my second winter season. Both protect against moisture and wind and are fit for biking. The pants have built-in velcro straps to secure the loose fabric. They are also built as a “shell” to quickly and easily pull over other clothing. The jacket is longer in the back, shorter in the front, and has long sleeves to maintain 100% barrier coverage in a forward riding position. Because each is a complete barrier, it inherently traps heat inside – which on cold days works just fine, but can become extremely hot very quickly on days above 45°F. My biggest complaint against both is that they lack pockets. Pulling up the jacket to reach interior pockets, or working my hands beneath the shell pants to grab keys or phone is a small nuisance, but does create exposure which matters on sub-zero days. My usual work-wear is dress slacks and cotton t-shirts. Short winter rides with a moisture barrier, no big deal. 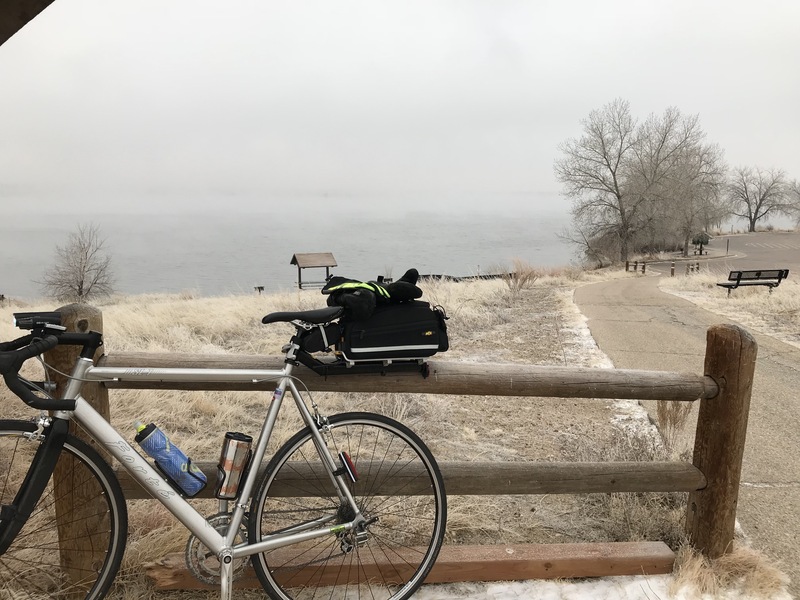 Longer rides – even with moisture barriers – creates an inverse problem: no moisture getting in, but my body’s moisture piled up on my inner layers. Regardless of where the moisture comes from, when it builds up against your skin in cold weather, you can be in danger. I read a lot of other winter bike commute guides and determined that cotton was no bueno if I was to continue long winter rides. Over the summer I had picked up lycra bib shorts and shirt. Note: I should probably bring up at this point the whole lycra and spandex thing. When I first started bike commuting I was 100% committed to never wearing that stuff. As my rides got longer and I dealt with more varying environments, I started to change my tune. Work slacks started ripping at the crotch from too much bike activity (this happened to about a half dozen pairs of pants). Shirts and jackets flapped in the wind or got grease stains on them. The variable wardrobe also made it hard to learn what worked and what I needed at specific temperatures. So I got over the lycra thing. You can definitely make bike commuting work without wearing bike-specific clothing. Especially if you are consistently riding less than one hour. I either just wear my bike gear on my errands or appointments or bring a change of clothes to slip into. It doesn’t take long to change. But now I view bike clothing as the uniform of road cycle culture and have embraced it. This last Friday I rode 85 miles in the cold over 7 hours. Lycra makes that possible. Both additions to my kit had worked great for long summer workouts to pull sweat away from my body and keep me cool. I imagined the same would hold true in the winter and the same outfit would pull sweat away and retain heat underneath my outer shell. Indeed. However, on a fall ride, I realized very quickly the limits of just shorts and short sleeve shirt hit about 60°F. Below that with a little wind and biking became quite uncomfortable. Lycra arm warmers: These are great to keep in my just-in-case bag or start a ride with and remove later as I get warm. Soft shell jacket: Great for when temperatures are in the 40°F to 50°F’s and there is no moisture or heavy winds. Lycra long pants: Perfect for putting over the bib shorts to cover my legs and pull moisture away from my skin. Full finger gloves: I don’t normally bike with any gloves, but I got a pair that was rated for 35-40°F. Head, ears, and nose are an absolute must. One of my old snowboard helmets had ear covers and very little dome ventilation. I kept the goggles on the helmet and realized how amazing of a solution it was for biking. No frozen air swooshing across my eyeballs and great at keeping my head warm. As temperatures dropped below 20°F, I needed more. I picked up a full head mask from REI and I could now withstand 0°F days without much ado in the head, ears, and nose department. The head mask easily pulls up over my nose to block the wind and the full neck, ear, and head coverage keeps everything cozy. You can easily lose 40% or more of your body heat through your head, so this is an important place to protect. Once temps dropped below freezing, my hands quickly became a weak point. My gloves were rated to 35°F and this became so apparent so quickly. On a few rides, I lost feeling in my fingers which isn’t a great thing considering how important they are for braking and shifting gears. I decided to try my snowboard mittens and they were a slam dunk. Not only that, but I just put them on over my gloves and they fit perfect. That way I can remove my hands from my mittens when I need to mess with my phone, grab a snack, or whatever and my bare hands aren’t getting exposed. I imagine next season I might invest in some specific below freezing gloves that are meant for biking. Shifting gears and braking in mittens can be a bit restrictive. My feet have proved to be my last major weak point in my winter armor. I use clip pedals and have a casual Shimano shoe that allows me to wear them like normal shoes. They aren’t a solid barrier – both air and water easily pass through the material. I purchased some inexpensive neoprene foot covers that work pretty well down freezing temperatures. Below that – even with wool socks – it seems that my feet go numb in about 30 to 40 minutes. On my recent 40-miler in below freezing temps with moisture, I found myself needing to stop and grab some foot warmers. I wore two pairs of wool socks with a heating pad on top and bottom of my foot. Altogether, this combination seemed to do the trick. However, by the end of the ride, the warmers were failing to keep up and my feet were again turning numb. My current plan is to ride out the remaining 2017-2018 winter season with my current foot situation. Next year I’ll be looking at specific winter biking shoes so I can continue riding with cleats. I have a 200km ride coming up on March 24th. Considering the length of this ride, depending on the weather forecast, I may or may not move this purchase up sooner. If you fail to check the weather when driving to a meeting – not a whole lot of negative creeps into your world. Perhaps there is a little more traffic or you “suffer” a bit of cold discomfort as your heated seats begin to circulate. When biking 20 miles across town, failing to check the weather report can leave you in a world of pain. Without the proper gear, you might find yourself calling an Uber, spouse, or catching public transportation. Bring lots of layers and options. 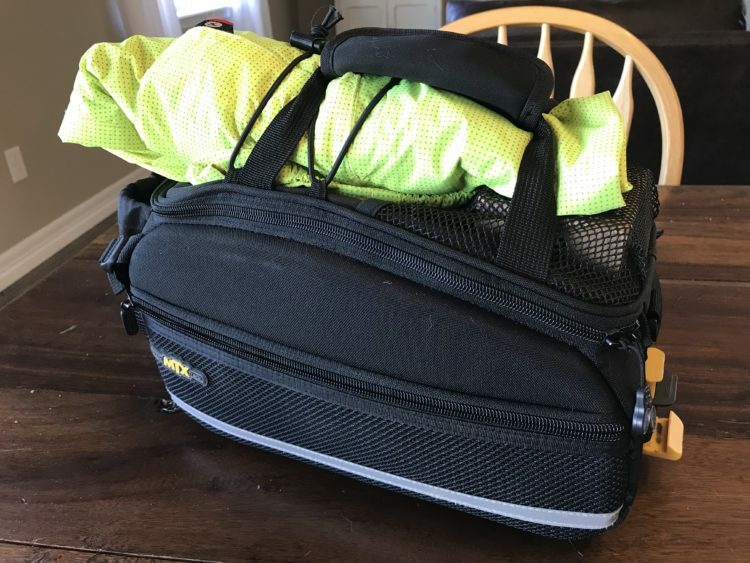 For a while, I wore a backpack that had all my bike kit packed and ready to go. I had my outer shells, arm warmers, foot covers, gloves, bike lock, and so on – all right there. As this got heavier, along with my laptop, I found that I started getting back pain during and after long rides. To help alleviate this, I picked up a seat-post mount and bag that easily slides on and off. This now contains all my kit along with spare bike tires, pump, and additional lights when necessary. Having all of my winter gear with me has helped me calibrate. I can confidently leave and think, “I’m a little cold, let’s see if I heat up,” and if I don’t, then I’ll add a layer on. Having options also helps out a ton as weather changes or my ride intensity does. I recently moved to Castle Rock, CO and the hills here are plentiful. It’s also about 1,000 ft higher than Denver. Sometimes I’m running super hot going up a long steep hill, only to freeze up just minutes later zooming down. And the weather can change pretty rapidly. Recently it’s been the 30+ mile an hour winds that seem to come out of no where and can make it feel 10 to 20 degrees colder than the thermometer is reading. The other day I was riding out to an appointment about 20 miles away over a new route. I had looked it up on Google Maps a few times, felt comfortable, but did not anticipate the swift weather change. By the time I was halfway, it had begun snowing really hard and the temperature dropped almost 20°F over the course of about 45 minutes. I was forced to take out my phone a half dozen times to navigate my way. Each time I had to slow down or stop, remove my gloves, fidget with my outer shell, and toil in frustration. The best way to stay warm while biking is to keep moving. Your body is your best heater. Stopping and starting affects your heart rate and heat production. Not only that, but one of the stretches of road was a heavy traffic street and it would have been a reach for my comfort level on a sunny day. Altogether I was relieved and thankful when the ride was over. Later on, I took a second look at Google Maps and decided that there was another route that would take about 10 to 15 minutes longer, but had only a couple of turns and would keep me on a bike path for the majority of the commute. A mental note is taken that I’ll need additional buffer time for the next go at this commute. You’ll notice that so far I have mentioned nothing about special tires or bike. I use the same exact bike and tires that I use during the Spring, Summer, and Fall with no problem in the Colorado winter. That being said, I tend to stick to plowed streets and sidewalks when possible. My road-bike tires have done just fine in snow so far. I have had a few “oh dear” moments, but no wipeouts yet. This gets back to knowing your routes. I know where I’m comfortable in the snow and where they clear the streets and sidewalks quickly. As I continue to ride more in the winter, I can see myself getting a second bike that is more snow/winter-focused with metal studded tires, but at this point, not having one has not really impeded my ability to ride in the winter. Biking is and should be a year-round activity. The same friends that look at me strangely and think I need my head checked for going out and pedaling on a 20°F day are the same people that take off Fridays to head to Vail when there is a blizzard outside and -4°F windchill. In my mind, there really is very little difference. But I have to also recognize the reality: most people see a massive difference. 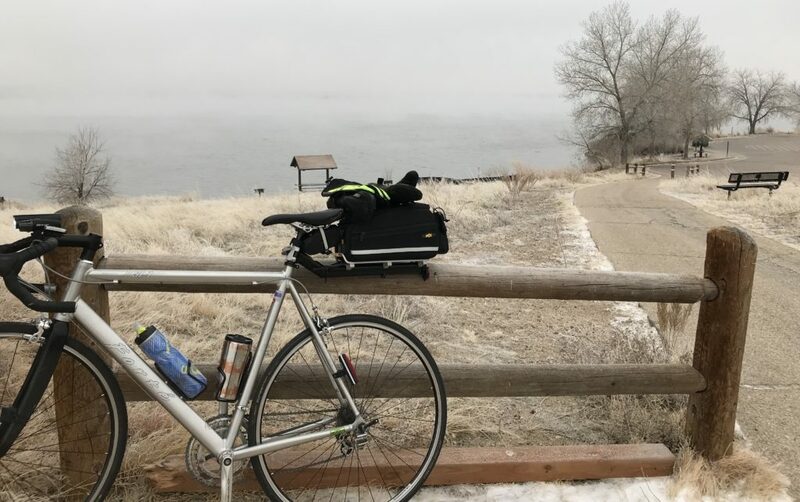 On my 40-miler the other day, I only saw a single person on a bike over a 3+ hour span while riding from Denver to Castle Rock – the majority of my ride on a bike path. I’m sure the same day at Vail and I probably couldn’t have walked 2 feet without running into another person engaged in snow sports. So there aren’t a lot of us out there. Getting home safe is priority #1. I’ve taken some ego hits when I felt a ride was entering unsafe territory by calling an Uber or my wife to pick me up. I’ve canceled rides and taken Ubers, to begin with, if my gut says it’s no good. I’ve stopped and warmed up in a 7 Eleven when I was concerned my feet were getting frostbite. All were situations that allowed me to reflect and learn to improve my approach to winter cycling for my next ride. Don’t get me wrong, I’m counting down the days to when I get to ditch the extra kit and return to warm, sunny days in the saddle. But I’m not going to wait around until then to enjoy my bike. And I’m certainly not going to let winter be the reason I go out and buy a car. I also bike commute. I have a 5.5 mile ride door to door. Dialing the gear in is essential and I am still working on that. All but 1.5 miles on a trail. I would add lights. I use them during the day for visibility. I also use a some cold weather military gear, and also discovered the ski Google’s trick. Our weather in Missouri is highly variable but less extreme. I am also lucky to have a closet at work. I bring in clothing and shoes once every 6-8 weeks and rotate. For my commute I use my old hybrid bike and even purchased an American made Wald handle bar basket. I love it. Great post!!! !